Theresa May must use the delay to Brexit to prepare for the next stage of negotiations with the European Union and avoid repeating the blunders made during the divorce process, a respected think tank has said. 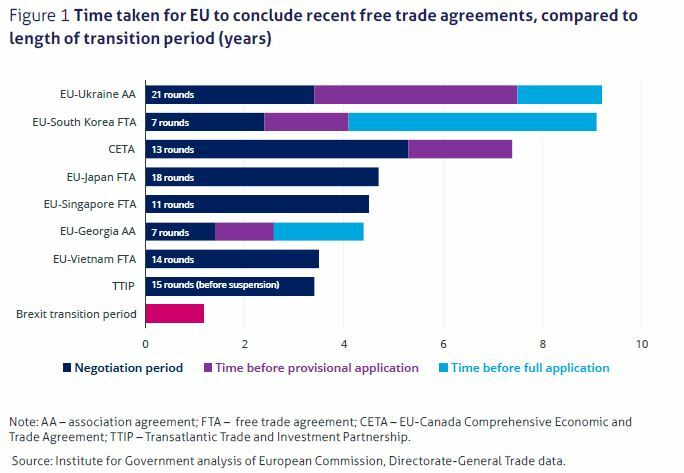 Talks on a future trade deal with Brussels will be “more complicated” than the negotiations on the Withdrawal Agreement, an Institute for Government (IfG) report said. In a highly critical assessment of the Government’s handling of the Brexit process so far, the analysis blamed Mrs May for creating the “unsustainable” split in responsibilities between Number 10 and the Department for Exiting the European Union (Dexeu), with the “secretive” approach adopted by the Prime Minister and her closest aides fuelling division. Negotiations on the first phase of Brexit were also “bedevilled by the difficulty of getting Cabinet agreement” on the kind of relationship the UK wants with the EU. Politicians, particularly on the Tory backbenches, “did not trust the UK’s official negotiators” led by Olly Robbins. “Ministers, from the Prime Minister down, were unclear about the instructions they gave to officials,” the report said, meaning that critics could blame the civil servants, undermining their work. IfG programme director Jill Rutter said: “The Prime Minister moved quickly to establish the Department for Exiting the EU and the Department for International Trade within a day of taking office. “Those hasty decisions created completely foreseeable problems for the exit negotiations, compounded by the inability of the Cabinet to reach an agreed position on the key future economic relationship. The think tank said the Government must use the delay to Brexit to set out a clear strategy for the future trade deal alongside its efforts to secure MPs’ approval for the Withdrawal Agreement. Before negotiations begin, the Government should publish a mandate for an “ambitious” relationship but based on a “clear view of what is negotiable” in reality. The first phase of the talks suffered due to the “inability of the politicians to make decisions and/or reconcile different positions – resulting in undeliverable objectives”, according to the IfG analysis. “A similar scenario would spell disaster for phase two,” the report warned. – The Prime Minister should appoint a ministerial deputy, based in the Cabinet Office, to oversee the day-to-day negotiations, taking that role away from Dexeu. – The Government should use the expertise in the Department for International Trade (DIT) whose staff currently have little role in the EU negotiations. – Parliament and the devolved administrations should be engaged with early and consistently. – The Government should rethink its approach to engaging EU states following “tone deaf” interventions by ministers and the failure of the “divide and rule” tactic of trying to go over the head of the European Commission’s negotiator Michel Barnier in the first stage. Tim Durrant, lead author of the IfG report, said: “Negotiations on our future relationship with the EU will be much more complex than the divorce. “They will also set the context for the UK’s relationship with other countries for decades to come. “It is vital that the Government uses the next months to develop a better understanding of how the EU will approach the next phase.